Jaquan Harris Guard (NJ Bulldogs) – Harris is a Point Guard that is in the conversation as one of the top guards in the country. He has the bloodlines as his brother Jamir was a top guard in NJ and is currently playing college at Minnesota in the Big 10. 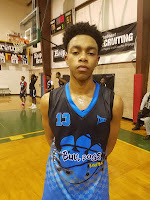 Jaquan is a smooth High IQ player that can really pass the ball but also understands when he has to take over the game scoring. His long range jumper was off in the championship but he still figured out a way to help his team win finishing with 11 points. He knocked down three 3 pointers in the semifinal win against Playaz. 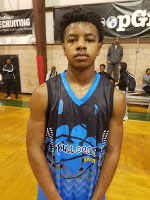 William Norman Forward (NJ Bulldogs) – Norman is a 7th grader playing up on the 8th grade team. Standing at about 6’4 he is a strong body forward that does most of the dirty work in the paint. He likes to attack the basket going downhill when he receives the ball at the high post. He is a good defender blocking shots and clearing defensive rebounds. He had 9 points in the championship win. 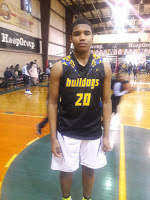 Hassan Jackson Forward (NJ Bulldogs) – He is a strong, long armed forward that can play inside or outside. He has a nice mid-range catch and shoot jumper and also can score around the basket through contact. He makes the right decisions and gets his points in the flow of the game. Defensively he can guard multiple positions and he helps his team rebounding the ball. He came up with 13 big points in their semifinal win. 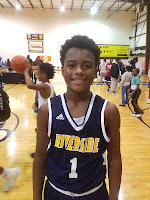 Jaquan Sanders Guard (Riverside Hawks) – Sanders is a miniature Draymond Green. He can handle, rebound, pass and shoot. He likes to let the long ball fly and when he gets hot he can knock them down consistently. We like the fact that he always seems to make the right play and he has a little flair to him as we saw him pull the arrow and shoot it after he made a 3ball. 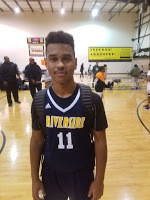 Francisco MatTei Guard (Riverside Hawks) – Mattei is a veteran to winning at the Spotlight and we love how he has transitioned to the perimeter. That means this kid is a worker and it shows on the court as he is relentless making winning plays whether it is diving on the floor grabbing a loose ball, getting a crucial rebound, or getting to the basket scoring a tough bucket in crunch time. He had 11 points in the championship. 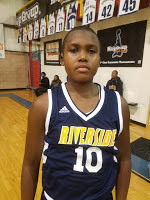 Joe Medlin Forward (Riverside Hawks) – This big man is a game changer for the Hawks. He is effective on both ends of the floor rebounding and blocking shots on defense and scoring around the basket on offense. He has nice height and strength already and he make his presence known in the paint. He tallied a team high 14 points in the championship game.